Tabernanthe iboga or Eboka is a perennial rainforest shrub and hallucinogen, native to western Central Africa. Iboga stimulates the central nervous system when taken in small doses and induces visions in larger doses. In parts of Africa where the plant grows the bark of the root is chewed for various pharmacological or ritualistic purposes. 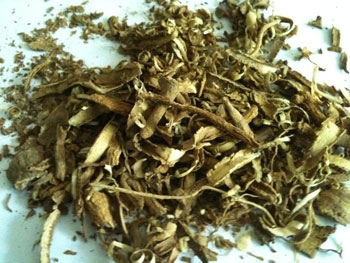 Ibogaine, the active alkaloid, is also used to treat substance abuse disorders. The active alkaloid is also found in Voacanga africana. The Iboga tree is the central pillar of the Bwiti religion practiced in West-Central Africa, mainly Gabon, Cameroon and the Republic of the Congo, which utilises the alkaloid-containing roots of the plant in a number of ceremonies. Iboga is taken in massive doses by initiates when entering the religion, and on a more regular basis is eaten in smaller doses in connection with rituals and tribal dances, which is usually performed at night time.